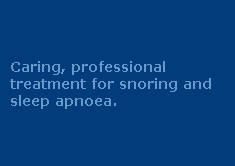 Dental treatments for snoring and apnoea / apnea, otherwise known as 'oral appliance therapy' are now a recognised treatment for snoring, sleep apnoea, and upper airway resistance syndrome. If you are seeking this form of treatment, call 1300 246 637 now to discuss your situation with a friendly sleep therapist. Recent, ground-breaking studies include the American Sleep Disorders Association Review titled “Oral Appliances for the Treatment of Snoring and Obstructive Sleep Apnea”, and the Academy of Sleep Medicine report titled “Practice Parameters for the Treatment of Snoring and Obstructive Sleep Apnea with Oral Appliances”. Dental treatments for snoring and apnoea come in many different shapes and forms – but while the appliances vary in design, they all have the same purpose in the end; namely, to hold the mandible (lower jaw) and connected tissues clear of the airway while the patient is asleep. In most cases, the appliance is an orthodontic retainer (similar in some ways to a mouthguard) or an orthodontic splint (a removable 'plate', something like a denture). In both cases, these appliances fit comfortably in the patient’s mouth and position the lower jaw forward to open the airway during sleep. When properly custom-fitted by qualified and specially trained dentists, and when constructed by properly trained and specially equipped prosthetic and technical staff in specially equipped dental laboratories, dental appliances are completely comfortable to wear. The patient need simply place the appliance into their mouth before going to sleep and then remove it in the morning. The appliances provided by Sleep Therapy Clinics are customised for you and work whether you breathe through the mouth or the nose. Your appliance can be adjusted by our qualified dentists at any time for maximum comfort and effect. Our expertise in creating these devices and our diagnostic and quality control systems mean that we normally get it right on the first attempt – however, you can have adjustments made by our qualified dental and prosthetic staff should they be necessary. In most cases, these adjustments are provided free of charge. Some side effects have been noted in some cases, although these are described as being only "mildly disturbing". Side effects include mucosal dryness, tooth discomfort, jaw soreness, and excessive salivation. These side effects usually pass within a few hours of waking and removing the appliance. The symptoms usually pass completely in well under 3 weeks. In the interim, some particularly sensitive patients choose to use simple pain relievers (aspirin and paracetamol) to gain relief from the tooth/jaw discomfort. The appliances are highly transportable and do not require any form of electrical power, which is a significant advantage over CPAP therapy and particularly important for anyone who travels. For this reason, oral appliance therapy is often used as a back-up or travelling treatment by patients who otherwise use CPAP. Does The Treatment Work For Severe Sleep Apnoea? The Sleep Therapy Clinics use a wide variety of different dental devices for snoring and apnoea, to suit the different oral topography and other requirements of each patient. These appliances are effective for patients with primary snoring as well as those with mild to moderate Obstructive Sleep Apnoea. Dental treatments are not generally 100% effective in the treatment of severe OSA sufferers and these patients will probably need CPAP treatment. A suitable and properly fitted device can often achieve a worthwhile degree of relief in even the most severe cases and so oral appliance therapy can sometimes be an excellent option for those occasions when CPAP users cannot get access to the electrical power needed to run the airpump units, or when it is inconvenient to travel with the pump kit. Treatment at The Sleep Therapy Clinics is available without the need for a doctor’s referral. One of our doctors will arrange a referral for your sleep study and a thorough examination will be performed to determine your suitability before commencing any treatment. Subject to your permission, your Sleep Therapy Clinic staff will write to your GP to advise them of your condition and the treatment. Most people have been told or assume that receding gums occur because of age, using a hard bristle brush or the occurrence of gum (periodontal) disease. In fact none of these reasons are correct in a majority of the cases. When teeth grind hard against each other year after year, they flex at the gum line and the enamel (which ends thinly at the gum line) microfractures away. The end result is an area at the gum line that you can catch your fingernail in and may get extremely sensitive to touch and/or cold. Wear occurs from the movement of the teeth against one another. Although all teeth may show this type wear, it is especially noticeable when a person has front teeth that appear having the same length - as if they were filed down. As teeth wear, the edges of front teeth and the cusps or corners of back teeth will begin to show microfractures or cracks. These cracks can not be seen on x-rays. It takes magnified vision and/or an intraoral magnified image to diagnose them. Where this becomes especially important, is that teeth with these type of fractures will either eventually chip, break a corner, or require root canal therapy. The reason for root canal therapy is that the fracture begins on the surface of the tooth and eventually deepens until the crack enters the area of the nerve. Sore muscles (especially in the cheek and temple area). When the muscles connecting the mandible to the skull are overused they may get sore - just like when you over exercise, your other muscles get sore. The Sleep Therapy Clinics offer a variety of different appliances, including some which are suitable for patients who are ‘bruxers’. In these cases, the appliance often serves a dual purpose – i.e., it is a treatment for the snoring or sleep apnoea at the same time as it protects the teeth from bruxing.